The Books for DC project makes the DC Public Library's resources more accessible by bringing them to digital platforms DC residents already use. Download for free for Chrome or Firefox. With the Books for DC browser extension, you can now easily determine the availability of books, ebooks, and audiobooks at the DCPL as you browse Amazon, Goodreads, and Barnes & Noble. Share us on Twitter ↗ and Facebook ↗. Show off your bibliophilic bona fides! Carry your huge library haul! 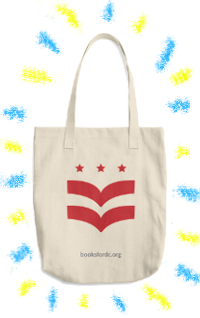 Spread the word about Books for DC on the District's streets! Your contribution pays for Books for DC's upkeep and allows us to promote our tools in the DC community. Thank you for helping us bring more readers to the DC Public Library! Wish you could keep up with the latest additions to the DCPL book catalog? Now you can. Just follow the @booksfordc Twitter account, which tweets out new books at the DCPL as they come in. Download any of our promotional images and flyers to let others in your community know about Books for DC's tools. Slate Future Tense: Looking for an E-book? Google Now Tells You if Your Local Library Has It. Books for DC is a project of Emanuel Feld. Send questions, issues, ideas, feature requests, rants, or raves on Twitter or by email at booksfordc at gmail dot com. This project's code is offered under a GPLv2 license.